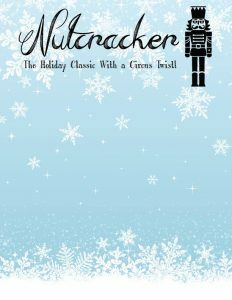 Nutcracker: The Holiday Classic With a Circus Twist! Dozens of circus artists of all ages and skill levels will perform to the classic holiday music of the Nutcracker in 3 family friendly shows! Show times are 4 PM and 8 PM on Saturday, December 16th, and 12 PM on Sunday, December 17th. All shows benefit the Madison Circus Space Capitol Campaign. Laugh, sigh, and be amazed at our winter extravaganza!